If you've never heard the term King Breakers, you're not alone. It's a term known by most escape artists, but not really a popular term outside of the genre. In the book, Houdini The Untold Story by Milbourne Christopher, the term used is 'defeaters'. King Breakers/defeaters usually refers to a set of handcuffs that have been gimmicked, reworked, faked or mechanically altered in some way that prevents them from being opened by normal means. Some King Breakers are simply impossible to open once closed. 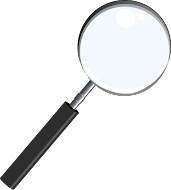 Others have been reworked to open with a different key or with a different device other than the standard key. And still others, might not be faked in any way but for one reason or another are extremely difficult to get out of even with a key. This phenomenon of having a cuff that could defeat an escape artist came about because of the numerous so-called Handcuff Kings of the early 20th Century. Competitors would use King Breakers to basically try and humiliate or destroy the reputation of fellow escape artists and magicians. Chief among them, HOUDINI. Quite possibly he was the originator of the King Breaker, I do not know for sure. But I do know he used them against fellow handcuff kings. And it's quite possible that their invention came about by sheer accident. 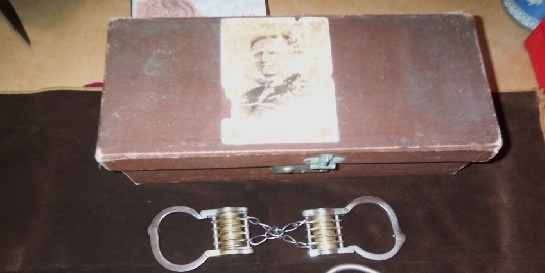 Houdini was once caught in a pair of cuffs that had been tampered with, even with the key they would not open. This was early in Houdini's career, and he had to have the cuffs sawed off. He thought his career over, but he soon found there was little coverage of his failure and what there was came down on Houdini's side. After the humiliation of having to have the cuffs sawed off, Houdini vowed to never have cuffs put on that he didn't first examine and make sure were in working order. This is why he often refers to 'regulation cuffs.' If he felt for any reason a cuff wasn't legit, he could claim it was not regulation and could dismiss the challenge. Of course, he could also use this type of strategy of having king breakers against competitors. What pair of cuffs were the first King Breakers? That's a tough question. As for regulation cuffs that have not been gimmicked, I would say the Bean Giants. 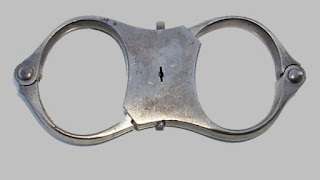 Once these cuffs were put on, they were quite rigid, restricting hand movement. Even with a key, it was virtually impossible to open them. Houdini came up with his own method to escape from Bean Giants and I think it remained the go-to method from his time forward. In fact, he even produced a challenge flyer to anyone who get out of the Bean Giants with them placed on behind their backs. For this he offered a $50 reward. It might be said that the Mirror Cuffs (photo top of page) were specifically designed to be King Breakers. Or at least that is what the publicity about them made you think. Over time, the theory behind the origin of the Mirror Cuffs is that perhaps the entire incident was concocted by Houdini. One clue is the fact that Houdini didn't have the cuffs tested beforehand. If you recall his embarrassment of being stuck in handcuffs. Well after this he always checked to make sure cuffs were in working order, but with the Mirror Cuffs he didn't. He surely did use the Mirror Cuffs later in his career, as his own personal set of King Breakers that he could challenge others with. In one instance, a young man took Houdini up on the offer to escape from the Mirror Cuffs. Houdini noticed the young man had thin wrists and would likely just slip the cuffs rather than open them. So Houdini locked the cuffs and handed them to the young man and told him to open them. After several frustrating minutes, the challenger gave up. I recall a conversation I had with the late Norman Bigelow about a pair of King Breakers he made. They were basically ratchet cuffs that had a pop rivet through the keyhole that prevented a key from being used. I assume they could be double locked and then the only way off is to saw them off, or possibly drill out the rivet, which could not be done during a challenge. Clever guy ole Norm. The photo above is from the recent Potter&Potter Auction. It's a pair of Lily Irons that have been turned into King breakers. They use a different key from the regulation one. Any would-be escapist with a hidden Lily key would be completed stopped cold with this particular handcuff. in the collection of escapist Jon Oliver, these cuffs have a unique origin. In June 1902, Houdini was in Holland. While there he received word there was an escape artist in Germany basically trashing Houdini's name. The man's name was Kleppini, and he boasted that he beat Houdini in a contest. Houdini was livid and took a leave from his contract in Holland to confront Kleppini. Houdini even wore a disguise! Houdini sat in the audience as Kleppini badmouth him. Then at some point, Houdini, disguised as a mere spectator, spoke up to contradict what Kleppini was stating. At the requisite dramatic moment, Houdini whipped off his disguise to prove HE was Houdini! He then challenged Kleppini to escape from his cuffs. He even offered to escape from Kleppini's for the sum of 5000marks. But Kleppini nor the circus manager would put up the money. After this the crowd began to disperse. The following day the circus manager visited Houdini with an offer of a challenge. In the process, the manager asked if Houdini would allow Kleppini to escape from an unusual set of French Letter Cuffs owned by Houdini. As he examined them, he asked Houdini the combination, which Houdini gave him. The word, 'clefs' which translated meant 'key' would unlock the cuffs. Houdini swore the manger to secrecy. 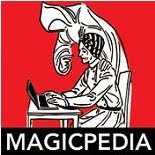 The truth is, Houdini knew that the business manger would tell Kleppini the key-word and when faced with the French Letter Cuffs, Kleppini would be victorious. But, as fate would have it, that was not the case. On the night of the challenge, Kleppini was unable to remove the cuffs. Why? Houdini changed the key-word. Houdini later let the manager and Kleppini know what he had done and that the new key-word was 'fraud'. Ouch! 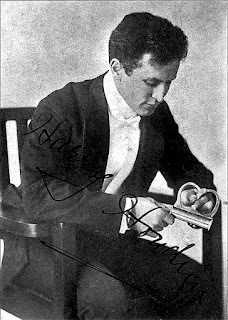 Pat Culliton in his fine book, Houdini: The Key, refers to the French Letter Cuffs and The Mirror Cuffs as SUPER CUFFS. I think it's a fitting description. He also adds that the Russian Manacles, Houdini Bell Lock Cuffs belong in this class and there is evidence some of them might have been made by handcuff manufacturer Thomas Froggatt. This means these special cuffs were made for Houdini and used both as a way to promote himself and as a way to defend himself. My old friend, the late Steve Baker, shared a technique he used when confronted with what he knew were king-breakers. He had them placed on between a number of other cuffs. In other words, they joined two pair of other handcuffs, but never went on his wrists. This technique was also used by Houdini. I can attest to being stuck in handcuffs and it's not a pleasant feeling. The night I was stuck, I did eventually open the cuffs, but not without some severe bruises to my wrists. A painful lesson, but fortunately something done privately for a friend and not publicly where it could have been embarrassing. Due to that one incident, I am very cautious about cuff escapes. I wouldn't have believed it, but Norman Bigelow assured me there are still folks out there, (mostly a-holes and angry escape artists) who might show up with a pair of king-breakers. The chances are slim, but like Houdini's early career embarrassment when he had to have handcuffs sawed off his wrists, the danger still lurks in the shadows. It is a good story and i really liked your articles. Because it is not easy to talk on such difficult topics of history related topics. I hope you will continue writing such articles.